Britain's David Stone defended his Paralympic mixed T1-2 road race title with victory at Brands Hatch. Stone held off Italy's Giorgio Farroni to take the chequered flag at the famous motor-racing circuit, with Czech David Vondracek finishing third. The 31-year-old Stone claimed the third Paralympic gold of his career after winning two in Beijing, as well as a mixed time-trial bronze in London. "David Stone is renowned for his ability to go well downhill and he did that at Brands Hatch. The crowd of about 5,000 were worried every time he was caught going uphill but cheered every time he opened the gap going downhill, and in the end he went round the final corner with a seven-second lead." In the Individual B race, Lora Turnham was eighth with pilot Fiona Duncan. Canada's Robbi Weldon and her pilot Lyne Bessette won gold ahead of Spanish pair Josefa Benitez and Maria Noriega, with Katherin Goeken and Kim van Dijk of the Netherlands claiming bronze. Ireland's Katie Dunlevy and her pilot Sandra Fitzgerald were fifth. 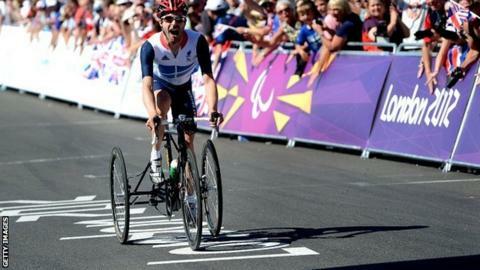 Stone, who has cerebral palsy and rides a tricycle, won Britain's eighth gold and 22nd medal overall in the Paralympic cycling events. "I made my move, but the Italian stayed with me. It was so hard," said Stone, who lost his Paralympic time-trial title on Wednesday. "It makes it better to win today because it was so disappointing not winning in the time trial. "It was the best race of my life. It makes the win better as it wasn't easy. Compared to Beijing the competition was so much better, it's good. It pushes me. It makes it a much better sport." And asked about the crowd at Brands Hatch, he added: "They were fantastic. I couldn't let them down today."